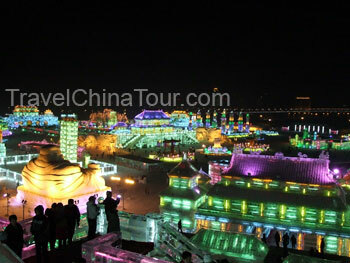 If you were to visit Harbin, then these two would be the two major tour attraction that you cannot miss. For a foreigner, you may be confused what the differences between these two events are. Both attractions are major winter events held each year in Harbin - when I was in Harbin during January, both events took place on the Sun Island, located in the northern area of Harbin. It's roughly a 15 minute taxi ride from city center. The Ice and Snow World is only about 1km away from the Snow Sculpture Festival. 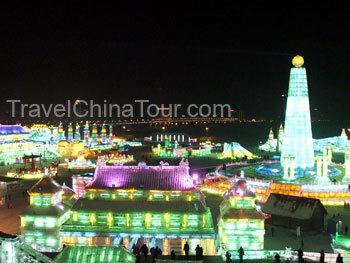 The Harbin Ice and Snow World festival is the most famous - it's world famous for its massive ice sculptures. 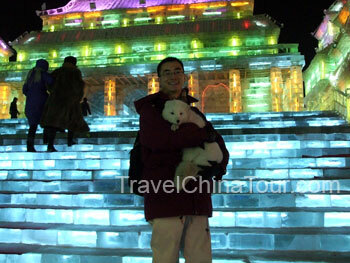 I believe the Ice Sculpture Festival began on December 24th (2006), and will end on Feburary 20th (2007). The Snow Sculpture Festival on the other hand, features mostly snow sculptures of all types and sizes. The main entrance gate, shaped like the Forbidden Palace in Beijing. The 8th Ice and Snow sculpture festival fills an area of 300,000 square meters, and about $40million RMB was invested in developing and setting up the attraction. There are in total 28 main features of this years Ice and Snow Festival, and over 3,000 individual ice sculptures. I learned that at one point, over 7,000 workers, and ice sculpture artists were busy at work developing the tour attraction. By 5pm it was already dark, and I arrived at the Harbin Ice and Snow World around 6pm. I can't begin to explain the sight that was before me when I arrived. 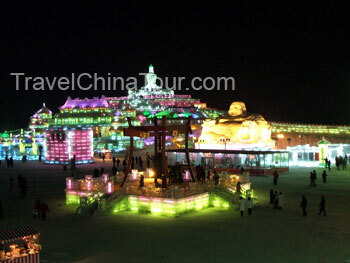 Simply put, the Harbin winter Ice and Snow World was an amazing sight! 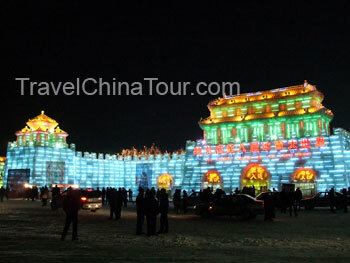 Life sized buildings made purely of large ice blocks lit with all colors of lights. There are sculptures of various types of Chinese, russian, and European buildings. On the right hand side, is another large gate leading to many large ice sculptures created like ancient Chinese architecture. There are also various smaller ice sculptures of poets, officials, generals, etc... In this area, there is also a gigantic ancient Chinese boat. A bit further in, is a large area filled with walls assembled with iceblocks that are showcasing Chinese art and caligraphy. Behind this showcase, is a gigantic (I mean HUGE) smiling buddha that is carved entirely of snow. 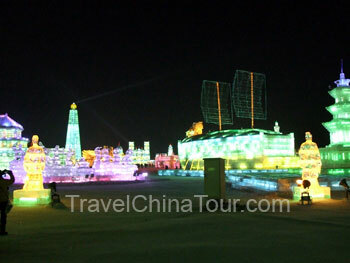 Ice sculptures of a large boat, pagodas, poets, and more. Going further inside the ice sculpture festival, is probably one of the main attractions of 2007's ice sculptures. It's an enormous ice building, which I think (guessing) that it's the White Lamaist Dagoba on top of the Qionghuadao Island in Beihai park in Beijing. Of course, this is totally just guessing, since their shapes are similar. :) See my Beijing blog entry about Beihai Park. Photo taken on top of the tallest ice platform - photo of the front court of the park. Photo taken on top of the tallest ice platform - photo of the middle area of the ice park. It's simply a gigantic ice structure that can fit at least 1,000 people on it. The climb up and climb down, however, is quit dangerous. Although red carpets are laid out in the middle of all the paths, and the ice stairs, many parts were still very slippery, and pretty much everywhere I turned, I saw people slipping. Quite funny indeed, as long as they weren't hurt. :) Once you get to the top of the ice platform, it is the tallest spot of the entire ice festival, and you will get a fantastic panoramic view of the entire ice sculpture park. Heading down the stairs, very carefully (still managing to slip 3 times), I came up to a stand where you can get photos with a snow fox. It costs $10yuan to take 3 photos with the snow fox. When I held the white fox in my arms, it was very, very soft and fury, and I could feel (even with gloves on) the thick layer of fat it has under its fur. A photo of me holding the pure white snow fox. At the center of the park is a gigantic circular, 3 leveled platform, with a large, tall standing ice structure in the center, and a round globe is placed at its peak. I believe this was the tallest standing structure at the park. You can see from the photo that even standing at the top of the ice platform, this structure is taller still. In the rear area of the ice festival, are mostly russian, and european styled buildings and structures. There is also an ice rink, and a small hill for bobsledding. In the same area, there were also sevearal large ice slides, where you can climb up to the top, and slide down. Heading on my way out towards the entrance from the other side of the park, there was also two miniature versions of Xian city's Drum Tower and Bell Tower. Tourists are free to beat the drum and sound the bell. They have several layers of ice blocks as the base, and one building has a large drum, and another has a large iron bell. Photo taken from the opposite side of the ice park showing the Bell and Drum towers, the gigantic smiling buddha, and the tallest ice platform. After touring around the other area, I headed back out toward the entrance. Near the exit side, there is a large Michilin ice and snow sculpture, advertising for Michilin products – wonder how much money they paid to construction of the ice and snow sculptures. It's always a pain to find a taxi in Harbin, especially at night. The taxi service in this city is quite terrible. The cab drivers all seem like a bunch of money hungry savages, always trying to pick up more passaengers, and you never know when you'll get taken for a ride! Even the locals told me that harbin taxi drivers are notorious for ripping off tourists and even local residents. Just be wary when you take a taxi in Harbin.